Alexander Moore was born at Tyrone, Ireland, about 1815, son of Archibald and Nancy Moore. He married Margaret, daughter of Robert and Rebecca. He died at Taree on 26 July 1891, aged 76, and was buried with Anglican rites in Wingham Cemetery. His wife died at Wingham on 12 June 1903, aged 88. Alexander Moore arrived in Sydney in 1840, aged fourteen. By 1852, he was established in the Pitt Street Labour Bazaar, formerly run by William G Moore. 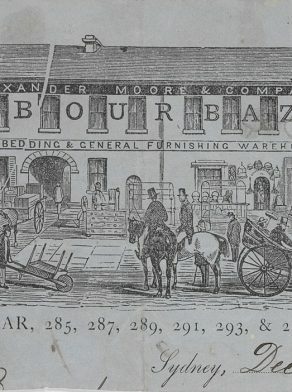 In 1858, Alexander Moore and company were advertising as auctioneers and pawnbrokers of 285 Pitt Street and Alexander Moore had his private residence at 4 Wylde Street. In 1877 he was at 347 Macquarie Street South. Alexander Moore was Alderman for Macquarie Ward, 1 December 1862 to 31 March 1864.